This month for the Birthday Block Swap, Stacy asked for 12" eight-pointed star blocks in batiks with a cream batik background. She wanted each block to stick to one color family, so I went with blue. 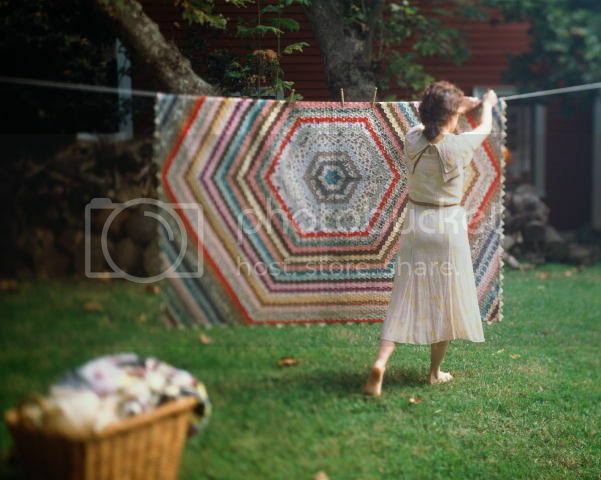 The block is called Galaxy Star, from The Quilted Snail. The block is not wonky, it just looks a little because the paper is still behind it (this block was paper pieced). Yesterday I also got some mail from Amazon... always fun! These two books have so much eye candy in them... in fact I have another book in the series coming from one of those discounted book sellers, I think it was only $3 plus shipping! Lots of fun ideas, in fact, I may be making my PIF gifts from one of the ideas in these books. I love books like that. Even though I never end up doing any of the projects. It's so fun to look and dream. The star looks cool. 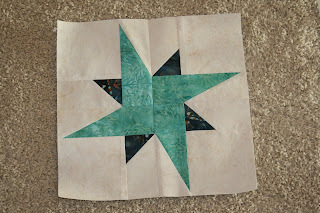 I love that star block - I'll file that one away for future use! Very pretty block Ginger. 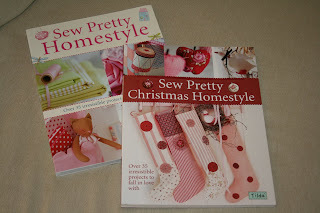 And I love those Sew Pretty books -- I have the regular one and have been debating whether to get the Christmas one! The cupcake in there is really tempting me! I bought that first Sew Pretty book about a year ago and have LOVED it. Clearly I will have to get the second one. And I DO love to paper-piece. my blocks never turn out that nicely. i love that star!